In a recent issue, I discussed Fitzgerald’s stay in Westport, Connecticut (my hometown), and I mentioned in a footnote that “J. D. Salinger wrote Catcher in the Rye in 1950, while living on South Compo Road in Westport.” When Catcher became a bestseller, Salinger fled the limelight, moved to Cornish, New Hampshire, and lived as a recluse. A correspondence school, as you may know, is a school where teacher and student correspond; before there were online schools, there were correspondence schools. Westport was home to an art correspondence school, the Famous Artists School, which purported to turn people into artists. Prominent artists like Norman Rockwell lent their names to the scam. One is reminded of that august educational institution, Trump University. You would send in a sample of your work, and then they would write back, saying you had great potential, and you should enroll in their school. Salesmen combed the country, recruiting gullible art students. Ads filled the newspapers. Money rolled in. It was so profitable that a Famous Writers School was also established in Westport, and it used the same business template as the Famous Artists School. Prominent writers like Clifton Fadiman, Bruce Catton, and Mignon Eberhart lent their names; Bennett Cerf of RandomHouse was one of the founders. By 1969, the annual revenue of the Famous Writers School reached $48 million, and the business’s stock price had gone from $5 to $40. A successful scam indeed. In 1970, Jessica Mitford published an exposé in the Atlantic Monthly; her article was called “Let Us Now Appraise Famous Writers.” After Mitford’s exposé, investigations were launched, the stock price fell, and in 1972, the Famous Writers School went bankrupt. I tried to visualize the day I would visit her at her convent. I saw her coming to meet me — near a high, wire fence — a shy, beautiful girl of eighteen who had not yet taken her final vows and was still free to go out into the world with the Peter Abelard-type man of her choice. I saw us walking slowly, silently, toward a far, verdant part of the convent grounds, where suddenly, and without sin, I would put my art around her waist. When I was growing up in Westport around 1970, the phrase “Famous Artists” was constantly ringing in my ears. The School rented space from Eddie Nash on Riverside Avenue. Since money was rolling in, they decided to build a new headquarters, and they decided that my neighborhood was just the place for it. According to Rumor (spread by my mother in countless phone conversations), the parking lot would have space for 1,000 cars. 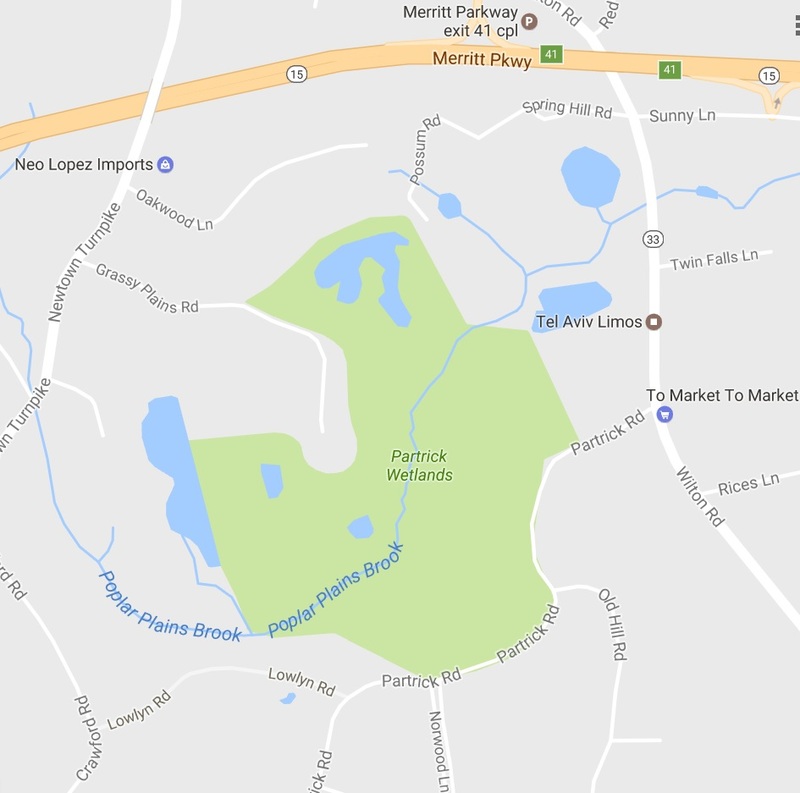 now known as Partrick Wetlands. We called it The Gravel Pit. My mother banded together with other neighbors, and formed a group called Families For A Residential Westport. (They could have called their group NIMBY, Not In My Back Yard.) This was the beginning of my mother’s long involvement in local politics. My mother’s group referred to their opponents as The Boyd Group (or, “The Boyds”). John Boyd was a prominent lawyer in Westport, and he favored business and development. He was probably hired by businesses who wanted permission to build. One of Boyd’s allies, Lou Villalon, ran the local newspaper, The Town Crier. My parents were Republicans, and so were The Boyds; the battle over Famous Artists wasn’t a Republican-Democrat battle, or a Conservative-Liberal battle, it was a Development Battle. Doubtless the Development Battle was fought in thousands of American towns. My mother’s group won the battle, Famous Artists never moved to my neighborhood. The next Development Battle in Westport was over Cockenoe Island, where a power company proposed building a power plant. Anti-development forces created their own newspaper, the Westport News, which became the town’s chief newspaper. The Battle of Cockenoe Island was also won by anti-development forces. A third battle was fought over a dairy farm, Nyala Farms, where a chemical company proposed building their headquarters. This battle was won by the development forces. I once discussed E. M. Forster with a Brown professor, who insisted that Forster was funny, not philosophical. I argued that Forster was funny and philosophical, just as Salinger is. I think Forster would have been a Salinger fan, he would have seen the Zennish element in Salinger, and laughed out loud at Salinger’s humor. Like Forster, Salinger was a student of Eastern wisdom. After reading Salinger’s story “De Daumier-Smith’s Blue Period,” I found an essay called “Salinger, from Daumier to Smith” by John Russell.1 Russell appears to be a leader in the field of Salinger criticism.2 Though his essay isn’t easy to read, it throws much light on “De Daumier-Smith’s Blue Period” and on Salinger’s entire oeuvre. The early stories are well-crafted, the late stories disdain craft and chase ultimate truth. The late stories “seem to loosen,” Russell writes, “as if in obedience to a new, anti-aesthetic principle.” One is reminded of Tolstoy who, at the height of his powers and the height of his fame, began to disdain literature, and chase ultimate truth. The aesthete Daumier wants to “escape the world,” Russell says. Daumier is disgusted by reality: “Through his aesthetic reaction he has made a moral condemnation of the normal world.” (One thinks of the young aesthete in Kierkegaard’s Either/Or, whom Kierkegaard juxtaposes with a sober, mature, ethical character, Judge William.) Daumier is disgusted by a shop window, horrified that he’ll always be “a visitor in a garden of enamel urinals and bedpans.” Later, however, he has a mystical experience at the same shop window, and he learns non-discrimination, he learns the sanctity of everyone and everything. Russell divides Salinger’s protagonists into two groups: mystics and striving artists. Teddy and Seymour are the mystics. (Such mystics may create art but they aren’t “striving artists,” they’re “pure artists.”) Seymour preaches non-discrimination: “I’ll champion indiscrimination till doomsday, on the ground that it leads to health and a kind of very real, enviable happiness. Followed purely it’s the way of the Tao, and undoubtedly the highest way.” According to Russell, such direct preaching is characteristic of Salinger’s later works. In the last issue, I discussed Michael Sandel, and I mentioned a paper that I had written when I was a student in Sandel’s class. My paper speaks of Hegel’s “relativity,” and Sandel put a question-mark on that word. Looking back on it, I think that’s a good word to describe Hegel. We find a similar relativity in Hegel’s view of religion and philosophy. Hegel said that every philosophy is partly true, true for its time; every philosophy speaks for its time. And every religion is suited to its time and place. Sandel didn’t understand Hegel’s relativity, and instead of asking me what I meant by that term (in a phone call or meeting), he simply put a question-mark on “relativity,” and gave me a low grade. I received a low grade not because I didn’t understand Hegel, but because I understood him better than the grader. I think this happened to me repeatedly during my college years, and it left me with a dim view of academia. I think Leo Strauss would have understood my term “relativity.” Indeed, it’s precisely that relativity that made Strauss an opponent of Hegel. Strauss felt that moral truth must be absolute, not relative.6 But Strauss didn’t use the term “relativity,” he used the term “historicism,” which means much the same thing in this context. Banfield, who was a student of Strauss’s, praised him for his modesty: “[Strauss] seemed to have no ego that required being shown off to a captive audience.” Strauss says somewhere that a professor should always remember that one of his students may be a deeper thinker than he is; Strauss was modest because he was aware that he might not be the deepest thinker in the room. My politics were further to the right than Sandel’s. I interpreted Hegel as a right-winger, while Sandel wanted to bring him toward the center. Sandel gave me a low grade because he didn’t understand Hegel’s relativity, and because he didn’t want to admit that Hegel was a right-winger. A conservative like myself is bound to get lower grades than a liberal because most professors are liberal, and they interpret the classics from their own liberal perspective. From their perspective, the truth is liberal, and the conservative view is further from the truth than the liberal view. In his comments on my paper, Sandel mentions “critical analysis.” In our time, “critical analysis” or “critical thinking” has become the bedrock of education, at least in the humanities. Critical thinking is one of those “vague general skills” that we discussed in a recent issue, one of those vague skills that has replaced actual knowledge. Critical thinking enables the modern scholar to turn Nietzsche into a radical leftist, and to perform other such feats of alchemy. “What about the great intellectuals of past ages — Montaigne, for example, and Copernicus and Tocqueville? Were they trained in ‘critical thinking’?” No, they had no such training, but nonetheless they could think at least as well as today’s critical thinkers; they had no such training, but they were hungry for knowledge. The Harvard English Department has at least a dozen scholars trained in “critical thinking,” yet they haven’t been able to determine who wrote Hamlet. Dugin is fond of the Old Believers, an EasternOrthodox sect. But he’s also drawn to Hermetism. Evola was enthusiastic about Hermetism, and spoke of a new Solar Civilization (Jung praised Evola’s book, The Hermetic Tradition). Evola was also enthusiastic about Eastern religion, yoga, etc. The New York Times describes Evola as a “brilliant student and talented artist,” and says that Evola was attracted to Nietzsche. Evola is admired by far-right parties in Europe, and also by the “alt-right” in the U.S.
Amazon has long been useful to self-published writers. It has allowed such writers to sell their books through a trusted source, and to sell them to an international market. More recently, it has allowed self-published writers to sell their books in e-book format, Kindle format. Now Amazon has taken a third step: it has entered the printing business. It’s allowing self-published writers to print-on-demand, so instead of keeping an inventory of books, you can print a book when you sell a book. This print-on-demand service is done through two companies that Amazon has acquired: BookSurge and CreateSpace. Previously, I used LightningSource, a division of Ingram, to print-on-demand. Amazon’s printing service works well if you’re selling books through Amazon; it relieves you of the task of shipping books to Amazon warehouses. But if you’re selling books to bookstores, you may prefer a printer like LightningSource. LightningSource charges for printing and shipping, but Amazon charges 40% of the price of the book, as well as printing and shipping fees. So Amazon isn’t a “pure printer,” they’re a book retailer that uses printing to aid their retailing business.